As you remember, in lieu of flowers I asked for donations in Mom’s memory to the USO for active service men and women. 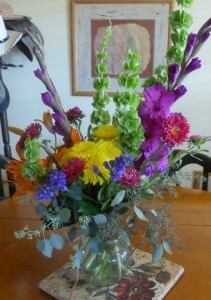 One flower arrangement did arrive after I came home, under the radar, so to speak. It was from my employer, The Bandera County Courier and the card simply said, “Thinking of You – your family at the Courier.” Nothing could have said it better. As a big a variety of flowers as personalities at the Courier! Love you family and thanks. I am also an active member of the Rose Garden Club of Medina and the Medina Garden Patch at the school. 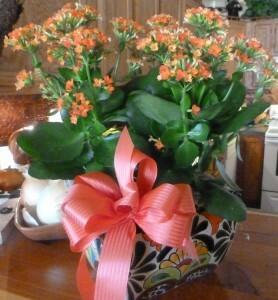 The ladies of the Garden Club all sent lovely sympathy cards and this gorgeous, growing plant. If it would have been kolaches, I’d have already eaten them! I’ve very lucky for all the beauty in my life and all the USO donations made by countless others. Thank you all for your love and support.